Box jumps can be performed on a box, small ledge, high curb, park bench, stadium bleachers, or just about any stable platform you find at a comfortable height. 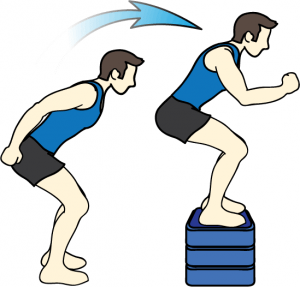 Jump using your arms and both legs at the same time. After jumping on the box, slowly step, or carefully jump down and repeat sequence 20 times. Three sequences would beneficial, but if you’re a beginner, either perform less jumps per set, or start out with less sets.